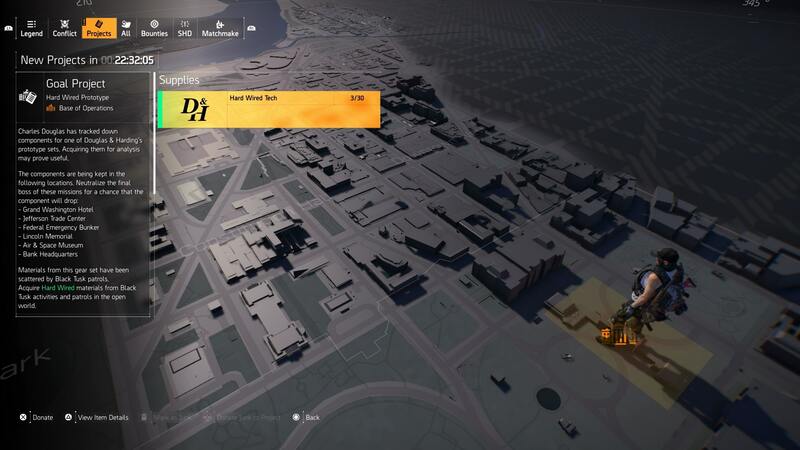 The Division 2 just received a major update, adding in the new Tidal Basin stronghold. That’s not all though, as new gear was also patched in, increasing the maximum Gear Score value to 500. Hard Wired items have also been added, with new Gear sets now available to players. It’s all a little confusing, so in this The Division 2 Hard Wired Guide, we’ll explain how to get Hard Wired Tech, and how to donate it to unlock Hard Wired Gear Sets. We’ll also be taking a look at the Gear Set Stats, for the Ongoing Directive, True Patriot, and Hard Wired Gear Sets. For more on The Division 2, be sure to head over to our The Division 2 Guides Hub. It’s where you’ll find all of our The Division 2 Guides content, from a look at the best weapons, to a detailed breakdown of the endgame content on offer. Gear Sets have just been added as part of The Division 2 Tidal Basin update. They are essentially new pieces of gear which can be upgraded by owning more items in a set. They are different to brand sets, in that they only have one rarity, and are represented by a light green aura. There are three new types available, each with a different kind of stat buff for completing the set. They are the Hard Wired Gear Set, the True Patriot Gear Set, and the Ongoing Directive Gear Set. Let’s take a look at how each works. The first Gear Set we’re going to take a look at is the Hard Wired Gear Set. This one can be viewed in your projects menu, where you’ll find the Hard Wired Prototype Project. To unlock the Gear, you’ll need to donate Hard Wired Tech, which we’ll cover later in this article. For now, let’s take a look at the stats for the Hard Wired Gear Set. (5/6) Electrify your deployed skills (hive, turrets, pulse sensor) causing enemies wandering too close to be shocked. Can occur once every 10 seconds. (6/6) Killing with a skill resets the cooldown of your other skill. Repairing a friendly agent's armor from zero resets the cooldown of your skills. Can only occur once every 15 seconds. When a skill cooldown ends (or reaches full charges), gain bonus damage and repair to all skills for 15 seconds. As you can see, owning a new piece of each Gear Set bumps you up to the next level, unlocking new buffs. Once you have collected all six components, and enough Hard Wired Tech, just head to your Projects menu. From here, you can donate each piece, and unlock the Hard Wired Gear Set. Next up is the True Patriot Gear Set, which is completed by picking up items dropped by Black Tusk enemies. 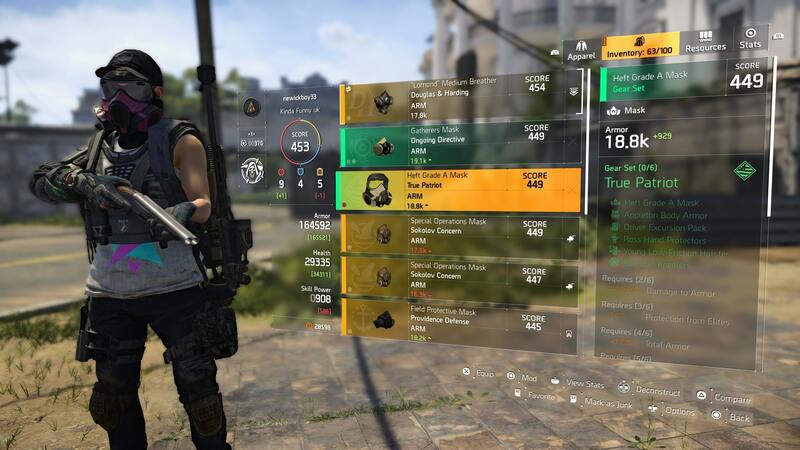 Here is the full list of stats for the The Division 2 True Patriots Gear Set. (5/6) Red, White, and Blue - When you shoot an enemy, apply a debuff to them. Debuffs are applied in the order red/white/blue representing the following. Red decreases damage dealt by enemies, white restores armor to allies that shoot this enemy, blue boosts skill cooldown to allies which shoot this enemy. (6/6) Full Flag - Shooting an enemy that has all three debuffs will deal 25% damage to any nearby enemies that have at least one of the debuffs active. Finally, we have the Ongoing Directive Gear Set. This one is great for adding burn and bleed damage. 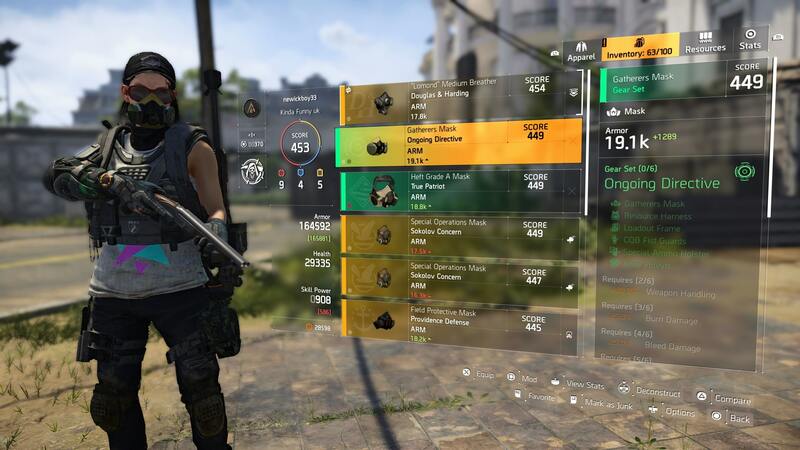 Let’s take a look at the The Division 2 Ongoing Directive Gear Stats. (5/6) Emergency Requisition - Combat resources (armor kits, ammo, grenades) within 40 meters of you are automatically collected. This occurs every 30 seconds..
(6/6) The Right Tool - Killing an enemy with a weapon grants some special ammo to one of your other weapons. In terms of getting drops for the new The Division 2 Gear Sets, you’ll want to play on Challenging if possible. The likelihood of Hard Wired Tech drops will increase, as will rare loot drops.